Why do you need a DOT Exam? It is mandated by federal guidelines that every commercial driver passes the DOT physical exam. The purpose of this test is to check whether a potential driver is fit to drive safely at the present time as well as in the foreseeable future. Passing the exam successfully usually means you only have to take the exam in 24 months time, although in some instances this period might be shortened in the case that serious health issues could arise in the future. This includes medical examination and laminated medical card. The Federal Motor Carrier Safety Administration (FMCSA), a division of the Department of Transportation (DOT), is charged with improving the safety of commercial motor vehicles and their operators. To this end, the FMCSA requires Commercial Motor Vehicle (CMV) drivers to have a physical exam, commonly referred to as a DOT exam, to ensure they are healthy enough to safely perform the job. 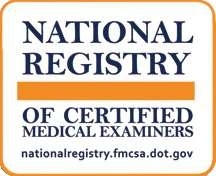 As of May 2014 new regulations require that the exam be performed by a Certified Medical Examiner who is listed in the National Registry of Certified Medical Examiners. Mental health issues (depression, panic, anxiety, etc.). To help facilitate successful outcomes, drivers should make sure they bring any relevant medical devices (eyeglasses, hearing aids, etc) to their appointments. Drivers may need to secure additional records from their primary care physician or treating specialists in advance of a DOT visit to possibly avoid disqualification. With or without vision corrections, each eye, as well as both eyes combined, need to have a 20/40 vision. Your bloodpressure must be under 160/100. Prescription medication may be used to control blood pressure. Neuromechanical Pain Management Associates is proud to announce that as of September 2015 we will be certified by the department of Transportation to perform (DOT) Physicals. We are pleased to offer certified medical examinations meeting all requirements of the Federal Motor Carriers Safety Administration. We offer a convenient location, easy access, prompt appointments and quick turn-around time. We’ll get back on the road. If you are a business with more than 10 employees, ask our office about special group pricing. In order to optimize your ability to get appropriately certified, we have the following suggestions. To better accommodate you and for faster service we ask that you call us for an appointment. Also note that if we can’t accommodate you when you walk in we can hold a spot for you for 50% deposit of actual cost.